Sorry for not posting regularly here, I was on holidays during late December till January, so didn’t get the time or the change to blog, but will get back to the routine of blogging more often. This blog post will be the continuation on Using Grunt. We went through some basic of using Grunt, in this post I will cover copy of files using grunt. One can definitely use their system commands (cp, mv, del, rm, etc) to copy files but having the task runner to automate it for you, will make the mundane task of copy easier and not to mention portable to other platform. In our example we will start off with a simple node express app and we wish to copy the html files to build folder. We will be using the grunt-contrib-copy plugin for copying files, the reason we will use grunt to copy files is because it will abstract away the system calls of copy from us, so that we can use the same script in windows, mac or in linux. We will now add the copy information and load the npm in our gruntfile. 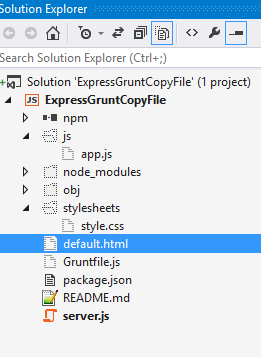 $grunt copy:html Running "copy:html" (copy) task Copied 1 file Done, without errors. $grunt build Running "copy:html" (copy) task Copied 1 file Done, without errors.